It's been a closely guarded secret, but this afternoon Frankel & Sir Henry Cecil formally opened The Horse Trainer Website Directory. He struggled a little with the scissors - cutting the lime green tape - but Frankel helped him out. OK, enough of the humour for a moment. We are please to declare that the gateway to every NH/Flat trainer websites, blog & twitter link is now as easy as ABC... Why should this website interest you? Simply, there is nothing like this on the internet. Certainly nothing which comes close to the speed you can navigate from one website to the next. Whether you want to see the latest news from Kevin Ryan's two-year-olds, to taking a gander at Ralph Beckett's Tweets or perhaps you want to read Ann Duffield's blog? 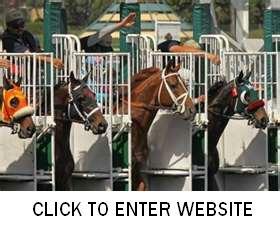 This is your one-stop shop to 100s of websites: everything that gallops, neighs and wins. Click on the photo above and see what you think. We are all about meeting your needs and love to hear your feedback. The trainer database is now complete but make no mistake this is just the start of this impressive enterprise. It is a facility which bloggers may wish to offer their loyal readers. We have already exchange a large number of links because people can appreciate its worth. Make The horse Trainer Website Directory work for you. Sit back and enjoy the ride as we go the extra furlong to detail the latest news from stables' great and small. Thanks for your support.